New Zealand is unique. It has relatively short distances between towns and attractions. It has a sparse population which means that you enjoy many amazing sights all to yourself. It is full of hidden secrets off the major highways, and has astounding natural beauty. For these reasons, it is pretty much the ultimate road-trip destination. A hire car in New Zealand gives you the freedom to choose your own itinerary, and take a chance on those enticing side-roads off the main highways. However, there are some pointers you need to know. Here are VroomVroomVroom's tips for your New Zealand road trip. Should you rent a car or campervan? Before you start, consider where you want to go, and who you are travelling with. While New Zealand has plenty of mountainous roads, a fuel-efficient modern vehicle will be able to handle most of them. Petrol is expensive in New Zealand, so don't take a larger vehicle than you need. Four wheel drive SUVs may be useful in the depths of winter. If you are heading to the snow consider hiring chains. You should also consider if a campervan would be better suited. While the upfront cost is higher, your ongoing accommodation costs would be less. We can help you compare the costs of either. If you decide to go with a campervan, think about where you will stay. 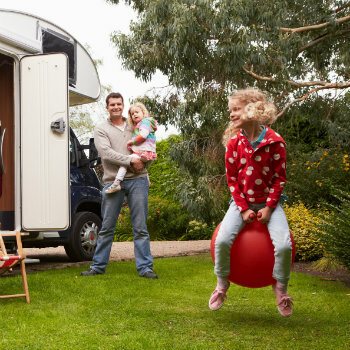 If you plan to stay in commercial campgrounds, you don't need to pay extra for a fully self-contained van. If there is any chance that you would like to 'freedom camp', basically sleeping on the side of the road, you must have a self-contained vehicle. Many tourist towns have strict laws, and fines for freedom camping. Read our Should You Rent a Car in New Zealand to know the benefits of renting a car in NZ. When to visit New Zealand and how long to stay? While New Zealand is a small country, there are plenty of must-see attractions here. The shortest ideal stay is within one to two weeks, enough to visit and explore 'A list' attractions. It is a good idea to concentrate mainly on one island, and plan to do the other on your next trip. Generally, there are fewer tourists in the North Island, but the one time you don't want to be road-tripping there is in the three weeks surrounding Christmas and New Year. Many people take their annual holidays then, and the coastal resort towns will be heaving with locals. Ironically, this is quite a nice time to be in Auckland. The city's problematic traffic eases, and the beaches are uncrowded. From mid-January, the hot-spots such as the Coromandel Peninsula and the beaches to the near-north of Auckland such as Mangawhai Heads and Omaha will empty out. The South Island generally has a much lower population than the North Island, so doesn't suffer the holiday crush to the same extent. 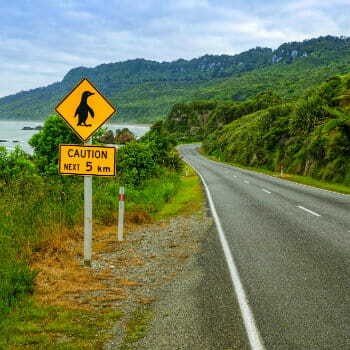 It's important that you are aware of the signs you will see on New Zealand roads. Take note that most signs are international symbolic, which means they use the same shapes and symbols for traffic signs from all across the globe. NZ signs are divided into : compulsory, warning and information signs. Because New Zealand is a small, mountainous country, many roads are narrow and twisty. It's important to be alert, and not in too much of a hurry. Allow yourself extra time in planning your journey, you won't always be able to steam along at 100 kms/hour. You will find you more likely to average around 70. In busy tourist areas, if you find the traffic building up behind you while you get used to the roads, it is normal practice to find a place to pull over and let cars past. Don't be alarmed if you get lots of toots when you do, everyone is just saying thank you! There's one in particular that is confounding to tourists; at one-lane bridges. As you approach the bridge, there will be one of two signs. A red circle with a red arrow on the left hand side, and the words, 'Give way' underneath means you must give way to traffic crossing the bridge from the other direction. A blue square, with a white arrow on the left, means other traffic must give way to you. You will still need to slow down, as you may have to wait for traffic already on the bridge to pass. The weather in NZ can change unexpectedly, so always come prepared and ready. It's essential to just be aware of what to expect from spring, summer, autumn (fall) and winter seasons. 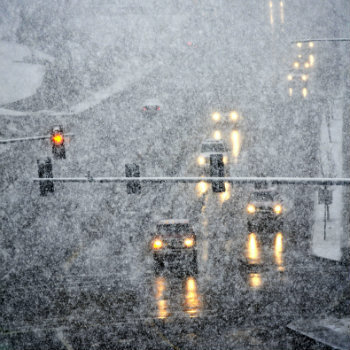 This is most important especially in the winter, when snowfall and hail can result in road closures. That said, heavy rainfall can be an issue at any time of the year, particularly in summer tourist spots such as Northland and Coromandel, causing slips. Another phenomenon in the South Island in winter is black ice. This is a thin sheet of ice on the road, almost impossible to see. There will usually be warning signs in areas of black ice; reduce speed, avoid sudden turns or braking, and allow greater following distances. See more Winter Driving tips here. Rental cars are not insured when crossing bodies of water. If you are planning to drive in both islands, you will need to leave one car in Wellington, and pick up a new one in Picton. This rule applies to any water, even if you are going to spend some time on Waiheke Island, leave the car behind, and enjoy a break on the passenger ferry. Learn more about the local road rules in New Zealand by clicking here. Should you need help with this, or have any other car rental questions in New Zealand, our customer care experts are ready to help. Contact us and we will do our best to answer all your queries at the soonest time possible. New Zealand's uncrowded roads can catch out rookie drivers. Please note also that road authorities such as local councils may have special rules for road users in specific areas. These restrictions should be indicated by signs or markings. The signs in NZ roads are divided into three types. Make sure that you really understand and comply with all these rules. Always stay focused and alert on the road as distractions and loss of concentration are major risks.